Nothing quite says ‘love’ like an amorous escape to one of the most romantic cities in the country, Kandy. Perfectly perched atop a hill, offering a spectacular view of the mountain ranges, the city and the scenic Kandy Lake, OZO Kandy has romance written all over it. Owning to the hotel’s cosy atmosphere and intimate spaces, this year’s Valentine’s theme is, ‘Romance in the hills’. Re-kindle over a delicious seven-course dinner at the hotel’s EAT Restaurant, adorned to ensure that love’s flame keeps burning throughout the night. A red rose, wine, and a mouth-watering dinner featuring Valentine’s favourites such as lobster and salmon await the happy couples. The night ends with special gift ofchocolatepetit fours as a symbol of love to takeaway. After anintimate dinner, couples can retire for the night inone of the 122 rooms at OZO Kandy to get ready for another love adventure the next day. OZO Kandy extends the normal Valentine’s Day to a two-day celebration for those couples longing for more romance. 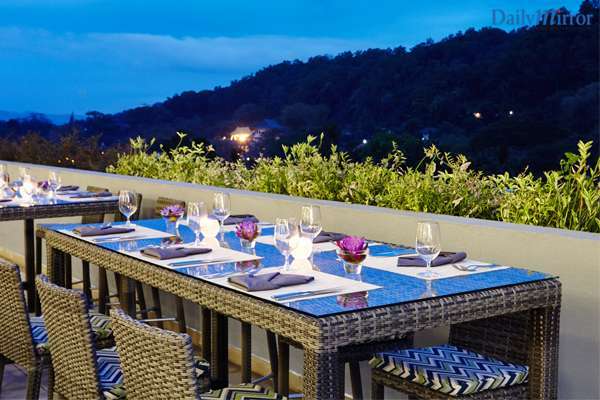 Imagine being in the arms of your beloved with the picturesque Kandy backdrop and a sky full of stars – that’s exactly what is planned at the Valentine’s Dance on 15 February at OZO Kandy’s private rooftop, Lake Edge. Situated at the heart of the country’s central capital, OZO Kandy achieves the perfect balance of charm and comfort, uniquely designed to allow each guest to rediscover the magnificent city of Kandy, as they experience the grandeur of a famed ancient kingdom, venture into a time gone by and explore a bustling, vibrant hill station teeming with life.